*.Smart Energy Saving Bulb] 8W 800lm LED bulb with E26 base, equivalent to 75W traditional incandescent bulbs. Saves up to 80% energy, Last longer and energy saver: Approximately 20,000 working hours. *.Wifi Build-in, No Hub Required] Controlling hub is NOT required. Supporting wifi 802.11 b/g/n 2.4 GHz wireless network and easily connect to your wifi router. *.Remote Control & Voice Control] Just download free APP: Smart Life, you may control the light individually or create different groups to control the lights in your home from anywhere. Smart light work with Amazon Alexa and Google Home, can be voice controlled. *.Multicolor and Bright Setting] 16 million colors are available, color temperature is 6000k. Choose different colors to suit your mood, and adjust the brightness based on your needs. *.Eight scenes & Time Schedule ] Eight scenes for your selection, and four scenes designed as Party, Read, Sleep, Meeting mode, and other four scenes can be randomly edited based on your favor. You may also set up multiple schedules to turn on/off according to you wanted preset time. Schedule can be repeated daily or weekly. *Smart Light Bulb, Wifi Smart Bulbs, 60W Equivalent(9W) Dimmable APP remote Controlled Daylight Night Light, Compatible with Alexa echo, Google Home Assistant, No Hub Required, multiple-color RGBW smart light bulb make your life more colorful and interesting. 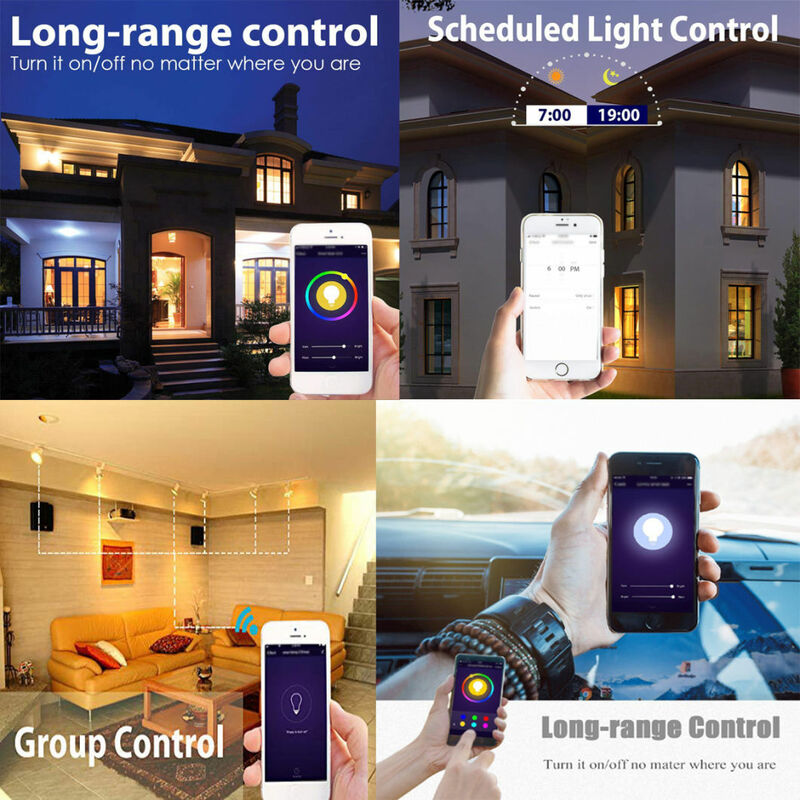 *Remote Control: You can control your led light smart from anywhere in the world. *Group Control: Control led smart bulbs individually or as a group. *Colors Settings: Personalize your wifi lights with a color palette of over 16 million colors, and every color is dimmable. *Timer: With light schedules, the app controlled bulb set alexa lights to on/off at a pre-set time. *Scene Mode: There are 8 scene modes to meet you life needs. You can also custom your own modes to have a blasting party. 1.Download APP "Smart Life" by scaning the QR code on the user manual. 2.Switch alexa bulb on and off constantly for three times(OFF/ON/OFF/ON/OFF/ON). 3.WiFi light will enter flash state after last step. Open " Device"option of APP and click " +" on the upper right conner. 4.Enter the option "light",then power on wifi bulb and confirm it quickly flash. 5.Select Wi-Fi and enter password.Wait for connecting and assign a name to each bulbs. Â *.Smart Energy Saving Bulb] 8W 800lm LED bulb with E26 base, equivalent to 75W traditional incandescent bulbs. Saves up to 80% energy, Last longer and energy saver: Approximately 20,000 working hours.